1. Cotton (1 piece of material and 1 piece of cloth). 2. 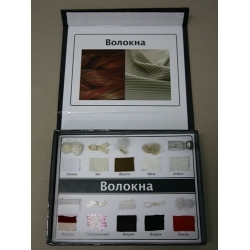 Glass fiber (1 piece of material and 1 piece of cloth). 3. Kapron (1 piece of material and 1 piece of cloth). 4 Nitron (1 piece of material and 1 piece of cloth). 5 Silk (1 piece of material and 1 piece of cloth). 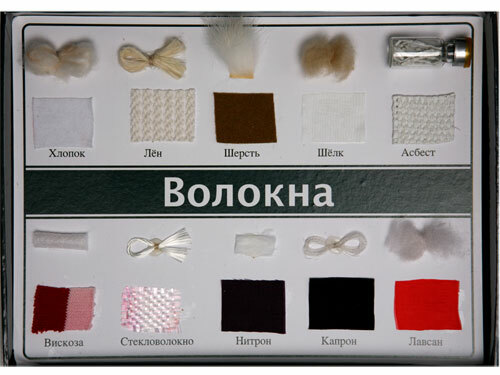 6 Wool (1 piece of material and 1 piece of cloth). 7 Viscose (1 piece of material and 1 piece of cloth). 8 Flex (1 piece of material and 1 piece of cloth). 9 Asbestos (1 piece of material and 1 piece of cloth). 10 Lavsan (1 piece of material and 1 piece of cloth).